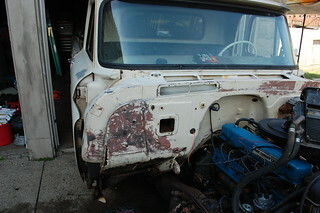 Once I had the front of both inner fenders patched, it was time to strip the rest of the front off. 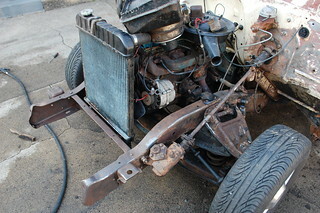 First the radiator support came out, which was just as much of a rusted ruin as I thought. 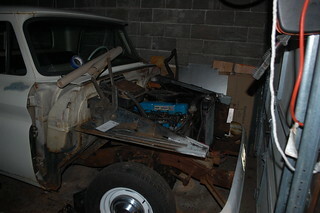 Fortunately though the frame where it mounts was fine, which means at least the frame doesn’t need repair. Next off came the hood with the assistance of my weekly gaming group. 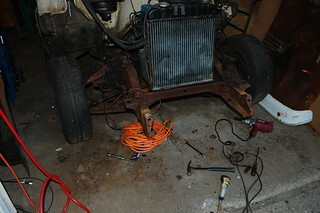 Then off came the inner fenders. All of this so far had come off with minimum fuss, next up was the bumper though, which put of a hell of a fight. The final tally when the bumper & brackets were removed was 3 snapped bolts, and 4 that needed to be cut off and 1 that actually came out intact. 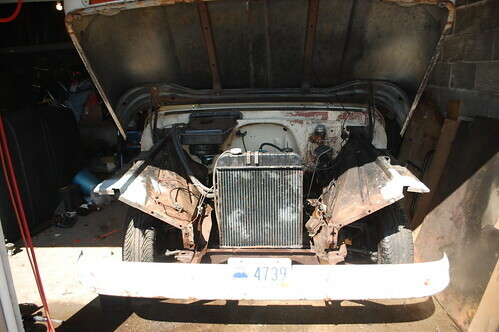 Once everything was off, I was finally at the point where (hopefully) the truck wasn’t going to get any worse and would hopefully start looking better. 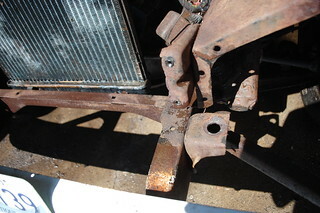 To that end, I ground down the surface rust on the exposed parts of the frame and firewall to start painting them. I am using paint designed for tractors in hopes of adding durability. The firewall is supposed to be the same color as the truck, but I decided to have it match the other panels in the engine compartment. After a round of painting this is what I ended up with. It looks really good in this shot, and while the frame came out great, the firewall ended up with a lot of runs & drip marks. 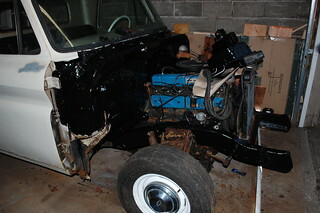 I’m going to put a coat of truck bed liner on the firewall to make it look smoother & stand up better to oil & grease. 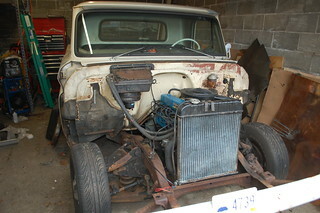 This entry was posted in 1964 Chevrolet C10 base longbed and tagged 1964, Chevrolet, pickup by Pixel. Bookmark the permalink.